‘Tis the season of giving and there are many ways to give back to members of your community who are in need during this holiday season. The United Way of KFL&A encourages you to consider a meaningful gift in kind this year. Whether it is food, household items, clothing, toiletries or even your time that you want to give, United Way can help guide your donations and ensure that appropriate items find their way to those who need them most. United Way is happy to accept donations and distribute them to organizations on your behalf, or you can connect directly, whatever makes it easier for you to give. Here are some suggestions in terms of areas of need. Both Kingston Interval House and L&A Interval House accept gently used clothes, linens and small household items. There is also a detailed list of their needs on the Kingston Interval House website with everything from make up to socks to zip lock bags as suggestions. Various organizations in the community run holiday campaigns for kids including Corus Entertainment and their snowsuit drive and Kingston Community Health Centres accepting backpacks, school supplies and winter boots. If you are interested in giving toys, consider donating to the Bell Media, Salvation Army toy drive. Many organizations in Kingston help vulnerable individuals who may be in need of the most basic necessities. Consider donating new socks, underwear and intimate apparel to groups like Outreach St. George, St. Vincent de Paul, Home Base Housing (adult, youth, family shelter and housing) and Kingston Youth Shelter (shelter and transitional homes) and One Roof. All of these organizations also accept other items like gently used outerwear and housewares. Nearly new business apparel and work appropriate clothing is always accepted by Dress For Success for women and Well-Suited for men in Kingston. They also accept work boots. Give both food and your time to various food programs in the area. The Christmas Hamper program through the Salvation Army is always looking for both, as are groups like the Partners in Mission Food Bank and St. Vincent de Paul. Many organizations also offer a hot holiday meal that are served on or before Christmas Day and volunteers may be needed – best to reach out to the organization to be sure. December 25 – St. Mary’s Cathedral at 11:30 a.m. and St. Paul’s Anglican Church at 11:30 a.m.
Give the gift of hope this holiday season by shopping online here for family, friends and neighbours, making a donation on their behalf to the United Way KFLA. Making a donation to the Gift of Hope is a great way to show your thoughtfulness and a great way to give a gift near or far. 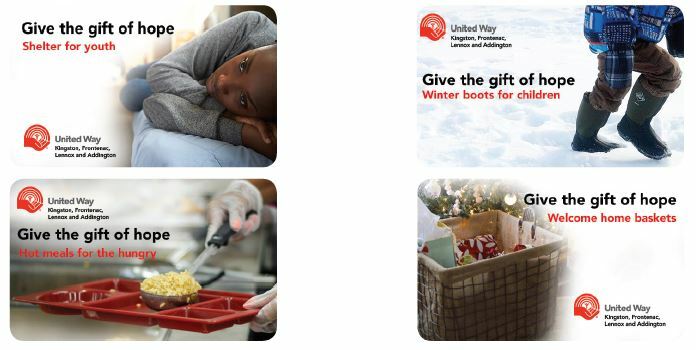 There are 4 ways to direct your donation this holiday season: winter boots, shelter for youth, hot meals for the hungry and welcome home baskets. Your recipient will know that you’re thinking about them, and you’ll know that you’re making a lasting difference in the lives of others right here in your community. To make a Gift of Hope please click here. Your tax receipt will be emailed immediately upon making your gift.